YF1AR yankee foxtrot one alpha romeo: What is a MW0JZE - G3TXQ Hexbeam? Top of post is plugged with PVC rod and sealed with Epoxy Putty, a plastic cap is placed on top to give a finished appearance. A stainless steel eyelet is fitted to the top where all the support cords are to be attached. RG-213 coax harness is fitted inside the post and M6 stainless steel machine screws are used to attach the wire elements to. Stubmast is fitted to the base of the post and is 28cm long with 35mm OD. Wall thickness is 3.5mm and a plastic plug fitted is fitted to the end to stop any objects entering the inside of the post and damaging the coax harness. Whole post is sprayed with spray paint and sealed from the elements. The MW0JZE - G3TXQ Baseplate is fitted to the bottom of the MW0JZE - G3TXQ Hexbeam centrepost, this is where the fiberglass spreaders are fitted. Plate is formed from high strength and lightweight T6 aluminium plate, Plate is 6mm thick and professionally cut on a CNC machine for 100% accurately cut MW0JZE - G3TXQ Hexbeam baseplates every time. All U-Bolts are M6 zinc and come with stainless steel washers, spring washers and nylock nuts. A maximum spreader diameter of 35mm can be fitted to the baseplate. 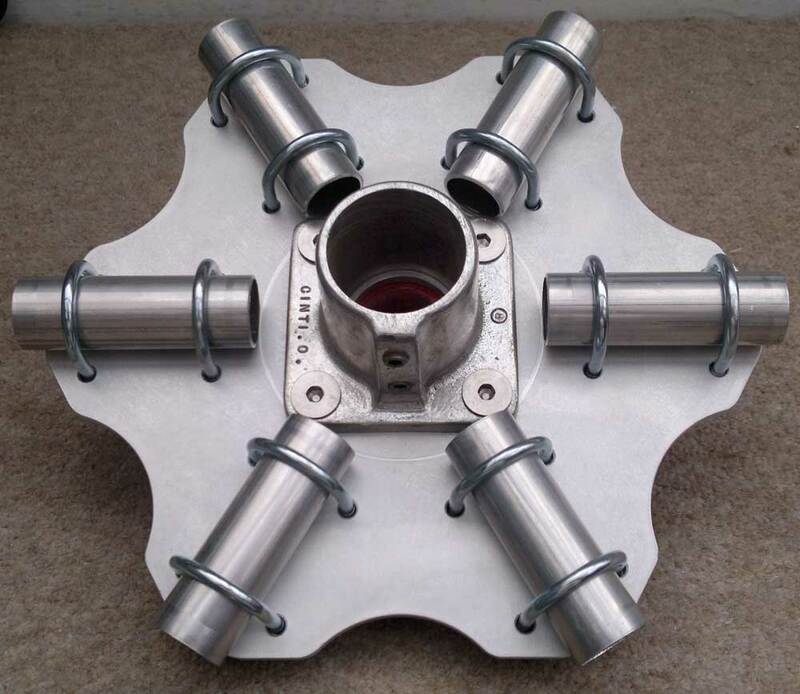 Top and bottom flanges are large diameter and will take a maximum of 48.3mm tube (not 2 inch). 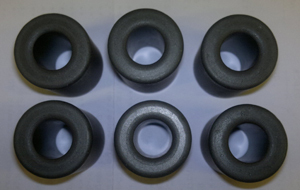 Flanges are formed from Magnesium Alloy, very light and very strong. The MW0JZE - G3TXQ centrepost is fitted into the top flange, you can fit the bottom flange directly into a 48.3mm tube OR using the supplied collar it can be fitted directly into a rotator. 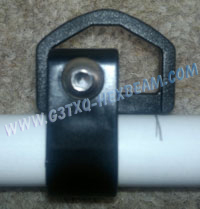 Note: This MW0JZE - G3TXQ Hexbeam Baseplate will also work with the Classic version from Mike Traffie. The end of each spreader section is sleeved with aluminium ferrules to prevent them splitting when pressure is placed on them when they are bent to form the shape of the G3TXQ Hexbeam by MW0JZE. Two (2) cords are fitted to the ends of each spreader be means of an eyelet or similar non ferrous fixing. One (1) is to be attached to the top of the MW0JZE - G3TXQ Hexbeam centrepost to form the bend in the spreader, the second (2nd) cord is attached to the tip of the next spreader, this forms the radius support for each tip. The cords are UV resistant polyester and each have a stainless steel hook or loop attached to the ends. 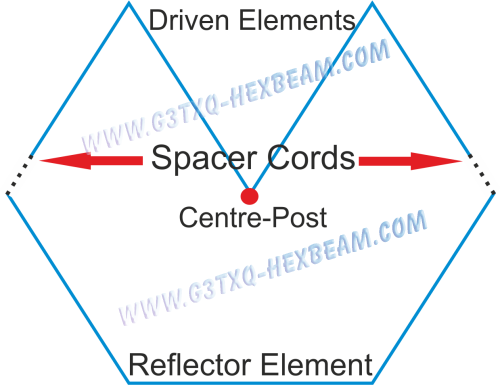 Each G3TXQ Hexbeam element from MW0JZE is made from seven (7) stand copper wire with a PVC coating with polyester spacer cords, all joints are sealed with heat shrink wrapping. I have recently bought a MiniVNA and am improving on the SWR charts and readings. The two types I refer to within this site are the 8T RG58 on FT240-43 but substituting the RG58 for RG142. Also the 6 x FB-31-1020 on RG213. There are many other ways listed on Steve's list below and more info can be found on his site. The bead method is by far the cheapest way of introducing a 1:1 choke the antenna. Simply place six of the beads over the coax as close to the feed-point as possible. These beads have a 10mm ID so will only except coax such as RG-213. Split end of coax WX proofed to feed Hexbeam. 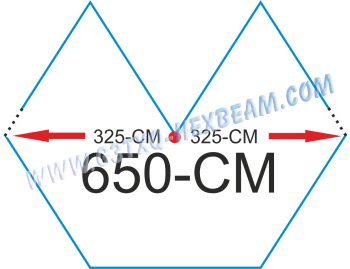 Note always feed Hexbeam at lowest band! 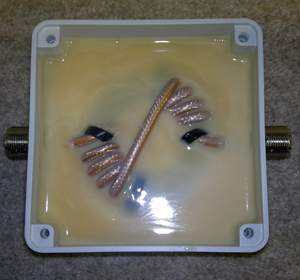 This form of choke is refered to as an Inline-Isolation Balun. Design is quite simple. 70cm of RG-142 high power coax coiled six times round a FT240-43 Torroid housed in a waterproof box and potted with Polyester resin. Termination is a chassis-mount SO-239 on opposite ends of the box.